W.I.P means Wakanda Income Program, an initiative by Ladina Integrated Services (Ladina Integrated Service, a Legally registered I.T. business in Nigeria with CAC NO: BN-2558110) conjoined With Wakanda Nation Forum. WIP is a program with a mission of dealing with financial problems in Nigeria among the youths, students, middle class and whoever that wish to take advantage of earning opportunity and making money online legitimately as it creates the channel for participant to earn passive income on weekly basis. WAKANDA NATION is not a ponzi scheme or a get rich quick scheme, it'll take you time and hard work but the results are far better than the invested funds or effort. On Wakanda Nation You earn by login into your WAKANDA NATION account daily, reading news, making comments, and even share assigned sponsored post on social media, As an affiliate for Wakanda Nation You earn instant N1,000 naira commission when anyone successfully registers on WAKANDA Income Program With Your Link. NOTE: YOU earn from Wakanda Nation Income Program even when you can’t refer anyone. Good day fellow Wakandians, Today I hope to answer a very big question almost all Wakanda Nation member ask regularly which is "How do I get Referrals on wakanda nation?". Now most of these Wakanda Nation members claims convincing people is hard, or lemme test it for myself first, or most times I'm not used to talking to people. Yes, I agree with all these! And some people seeing I have over 10 referrals in less than a week tend to wonder how we run our own things differently. In this article, I'll drop some of my tips and also offer you a crash course for 3 days via whatsapp, email, e-books e.t.c. on how you can also get started and become a pro marketer, and the course will go for just N2,000.... Now before you shout out don't forget that Wakanda Nation won't be your last internet business. In fact NNU and Wakanda Nation makes me the least money I earn online monthly, and both platforms earns me some cool thousands monthly. I earned all these commissions from my marketing skills and of cause by God's help. So I'll be offering this course and I won't be teaching you Wakanda Nation but something you can apply everywhere and earn steadily. The course usually goes for 5k, but these are my Wakanda brothers and sisters so I gotta do the bonanza wella. These tips will cover how to earn a lot from The Wakanda income program; some of my tricks personally. Acknowledging the fact that your earnings depends on your input we've gathered some tips and strategies to help you earn more. Some people earn well over 20K Weekly while others are battling to reach the N4,000 threshold WEEKLY so here's what to do to break that circle. Get referrals - Instead of stressing yourself excessively with activities, I'll advice you focus on the referral program, everyone who hears it would love to join. H. Flyers and Banners E.T.C. For those who don't like talking to people, try flyers, bulk sms, whatsapp groups.... But wait some of the things I listed will cost you up to N2,000 to start-up (Like the blog, flyers, mini seminars, bulk sms, Facebook ads). Lemme say this first! Consider Wakanda Nation Income program as a business, come in with the mindset of investing an extra N2,000 to start earning at least 10K weekly. In the crash course all these will be explained in details!! The above are some few techniques I apply to get Referrals but let me tell you this.... The difference between the rich and the poor is in sales - Robert kiyosaki. Want to take the course?? After that, call/sms/whatsapp me on 08103171693 with payment proof and you'll be added to the team ASAP. We already have some persons taking this course!! Welcome to WakandaIncomeProgram.review, Today I'll like to show you how to make up to 40,000 Naira or More weekly by reading news, making comments, sharing posts E.T.C using the Wakanda Income Program (W.I.P). We'll be running through a brief and life changing review about Wakanda Income Program (W.I.P) which is proudly powered by Wakanda Nation (Wakanda.ng) under the auspices of Ladina Integrated Services which is a duly registered I.T company in Nigeria with office In Abuja. 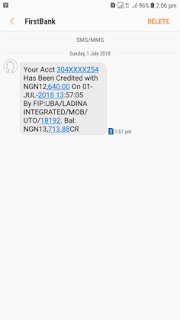 This review will help you conclude of Wakanda.ng is legit, scam or worth investing on. Plus we'll show you how to make huge profits from this program. It's not news again that you can get paid to read news online in Nigeria because we've been enjoying NNU Income Program for over a year now But what is new is the Wakanda Income program. 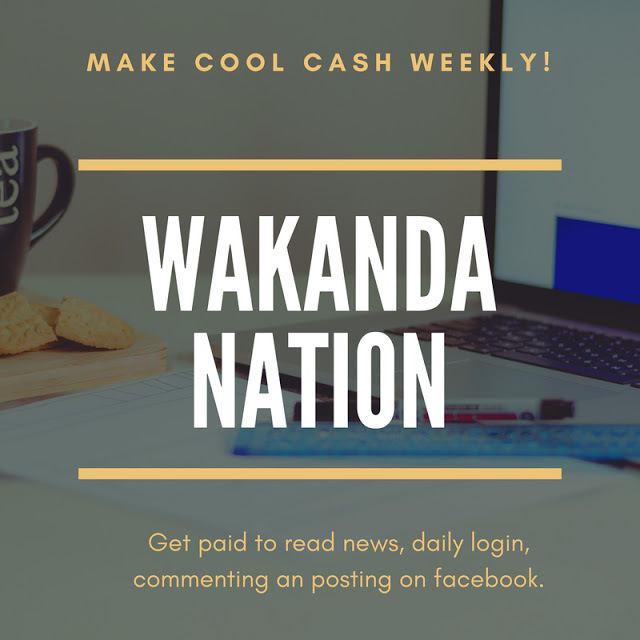 With the Wakanda Nation Income Program, you can make money reading news articles, commenting and posting on facebook. The number one unique thing about the wakanda.ng is it's the easiest way to make at least 4,000 Naira weekly online in Nigeria but in this article you'll learn how to make 40,000 Naira Weekly, However this depends on your input. MAKE MONEY ONLINE READING NEWS WITH WAKANDA.NG. You've been reading and making comments on Nairaland forum, Linda ikejis blog, Punch newspaper, BNL newspaper, Daily Post Newspaper and gets nothing for your efforts. Well I'm going To introduce you to a company that pays you for what you're already doing on these sites. Wakanda Nation does not pay you billions one-time but if you have only one source of income then your life is in chains. If you have ₦1,300, then lemme show you how to turn it to an extra ₦40k or more weekly. Wait did I just say if you have? See, Go and borrow if you don't have it... It'll change your life. WAKANDA.NG is a forum that pays you for doing what you usually do without getting paid elsewhere​. Wakanda Nation pays ₦2 per comment on their forum. Wakanda Nation users also Earns ₦50 by simply sharing an assigned sponsored​ post on Facebook. Wakanda Nation Forum assigns a sponsored post to members in their dashboard to share on their Facebook timeline, you earn 50 Naira daily on assigned post you share as recommended. The list is endless, All for a one-time Investment of ₦1,300. If you don't have ₦1,300 I urge you to go and borrow it, except you're among the lazy Nigerian youths Buhari talked about. And note that referring is not even compulsory for you to earn. Let's say you login Daily and earn N50 Daily, You connect Your Facebook and shares the daily sponsored post on your timeline​ and earn another N50 daily. That's 100Naira daily already. Let's say you make just 100 comments daily which earns you N200. That's 300 Naira daily. (Which is 9K monthly). You have earned yourself an extra 13,000 - 14,000 Naira Monthly. And this is the lazy man calculation. So you can imagine earning an extra 50K to 100k or more monthly aside your salary and other sources of income just by devoting 1 hour daily, And the best part is WAKANDA INCOME PROGRAM pays weekly, So earning an extra N20,000 to 40,000 Naira or more weekly is inevitable. 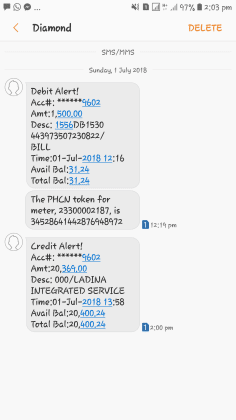 For the sake of some doubting Thomas's I got some alert screenshots from Wakanda Income to Wakanda Nation members that will burst your brains.... You can only shout "Ahh!! For just N1,300?". 12K received for the week for just N1,300 invested. You can easily Join WAKANDA NATION by clicking the JOIN WAKANDA link below. Acknowledging the fact that your earnings depends on your input we've gathered some tips and strategies to help you earn more. Some people earn well over 20K weekly while others are battling to reach the threshold weekly so here's what to do to break that circle. A. Decide the minimum comments you'll make in a day e.g: you can set a target of 500 comments daily. B. Be Active in Forum and don't miss any login or sponsored posts. (Don't forget sponsored posts and login alone will make you #100 daily. C. Set leisure hours for each activity. This will enable you treat priorities firsts and not mismanage your time. D. Make sure minimum comments are covered every day. (When you set the target, be diligent with it). 500 comments a day + login + Sponsored post will make you 1100Naira daily, N7,700 Weekly. Welcome to the wakanda nation income program knowledge base for tips, tutorials e.t.c. about W.I.P (Wakanda Income Program). Wakanda Nation is your one-stop platform for news, infotainment and online community interactions. Wakanda Nation is owned and managed by Ladina Integrated Service, a Legally registered I.T. business in Nigeria with CAC NO: BN-2558110. Address: Block A47 Royal Estate, Galadimawa, Abuja. Phone: +2347069694497. Wakanda Nation provides you the ample and rare opportunity to make money when you register and login, read our daily news, share our posts and interact with thousands of forum members. So, don’t just read news, make money too!